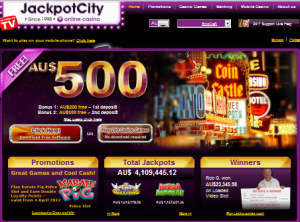 Jackpot City online casino is an online gambling website, offering up a great selection of games from Microgaming. 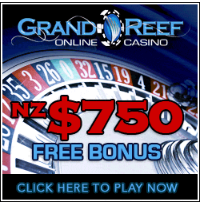 It is a great introduction into a fast paced, spin heavy, colourful casino, with a heavy weight toward slot machines. The experience is preset so you can start straight away with the free games, as a smooth introduction into the short loading times and easy functions for simple play. This, however, does not deter from the real money games as they all play in a similar fashion and offer up an exciting online gaming experience. It can be a little tough finding out how to receive the $500 first deposit bonus, but after a little digging, and two separate deposits, it’s pretty simple after that. If you’re having trouble find out how to cash in on the bonus, here’s a little bit of help: with a first deposit of $200, you can claim a 100% match bonus and the same does with the second deposit $300 match bonus. The loyalty point scheme works as it does in most online casinos. Players earn between 1 and 3 loyalty points for every $10 they spend on Jackpot City’s games. Video poker, craps, blackjack, baccarat and red dog offer 1 loyalty point; roulette, bonus slots, progressive slots, pai gow and casino war offer 2 loyalty points. Classic slots, scratchcards, sic bo and keno all offer 3 loyalty points. These points have no cash value, but they can be used to spend on Jackpot City’s casino games, acting as a cash-back bonus. After this, there is not much more to look forward to when it comes to bonuses in Jackpot City’s main casino. However, there is a large emphasis on mobile gaming, with 150% bonuses – and every Friday the biggest players and depositors stand a chance at generous bonus prizes, as well. Jackpot City boasts over 350 games with the downloadable software and 150 in the “non download casino option.” This includes many of our favourites like baccarat, roulette, and even slots tournaments and online scratch cards. The games play well at a high speed and minimal effort with flawless animation. You will seldom lose interest and always have the next slot, table or hand ready. In the Flash-based version of the website, there are 200 casino games available. No download is required so you can save space on your computer. The performance of these games depends entirely on your internet connection so you may find that the animations lag at some points in your gaming experience. One of the best features of Jackpot City online casino is its mobile casino option. This option slows you to take Jackpot City’s most popular online casino game with you on the go. It is available on Android and Apple devices, and installing it is very simple. By provide Jackpot City with your phone number, the casino will text you the download link, and the process is quick and convenient. Jackpot City is powered by Microgaming, so you can be certain that the site is eCOGRA certified. This means that the casino has passed rigorous testing to ensure that it offers players a safe and secure online gambling experience. The casino is also associated with Gamble Aware, an organization dedicated to responsible gambling. As such, you can rest assured that the operator of Jackpot City online casino only has the player’s best interests at heart. Banking at Jackpot City also awards the player a convenient a trustworthy experience. Jackpot City works with companies like Visa, Mastercard, NeTeller and Entropay, offering players from New Zealand players 15 different deposit options. All banking is processed within just a few hours – with the exception of cheques and bank transfers, which can take up to 5 days. Having been in the online gambling market since 1998, it is obvious that Jackpot City has more experience than most other casino operators. The site provides players with exactly what they are looking for: generous bonuses, hundreds of games and efficient customer service. It is one of the best online casino websites out there at the moment, and it is highly recommended.